Wearable Computing: Are Cyborgs the Future? 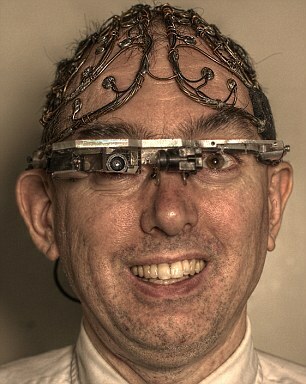 Google Glass is scheduled to hit consumer markets in 2014, but one person, Professor Steve Mann, has been using optical head-mounted computers since 1980. Unlike Google Glass, Mann’s EyeTap Digital Glass has become a more or less permanent fixture of his life. The EyeTap Digital Glass is often attached to Mann’s head via nodes. The evolution of Mann’s technology over the last 30 years demonstrates the drastic changes that we can expect in wearable computing in the upcoming 30 years. Google Glass is poised to kick off mainstream usage in the near future, but its current ungainly and unstylish (in this writer’s opinion) appearance will without a doubt steadily become less obtrusive with future developments. Perhaps the most exciting part of wearable computing comes not from these devices themselves, but from their future potential. Mann, for example, suggests that wearable computers could be used as a sort of extended memory to aid people with Alzheimer’s. Similarly, apps are already in development that can identify and display people’s emotions, which could be beneficial to people with Autism. Like with any new technology, difficult questions will have to be addressed, such as privacy, safety, and social implications. Wearable technology is designed to go with you everywhere, always. This could leave you extremely vulnerable if cybercrime were to also make the leap into wearable computing – and it will. Do we really want just anyone to have access to a video stream of our life? Of course not! Do the benefits outweigh the risks? Probably. I see wearable computing as a field with the potential to help a great number of people, and in today’s technology-hungry world it seems unlikely that wearable computing won’t be adopted. However, I also struggle with current levels of connectivity. The desire to remain constantly connected with others is a natural human feature, but I also feel like we lose a little bit of ourselves when we lose the ability to disconnect. Wearable computing has a lot to offer, but as for myself, I think I’ll wait a little while before strapping the internet to my face. This entry was posted in Wearable Computing and tagged EyeTap Digital Glass, Google Glass, Mary Lou Jepson, Sension, Steve Mann, Wearable Computing. Bookmark the permalink.